Interview with Thomas Ericsson, CEO of Gränsfors Bruk. 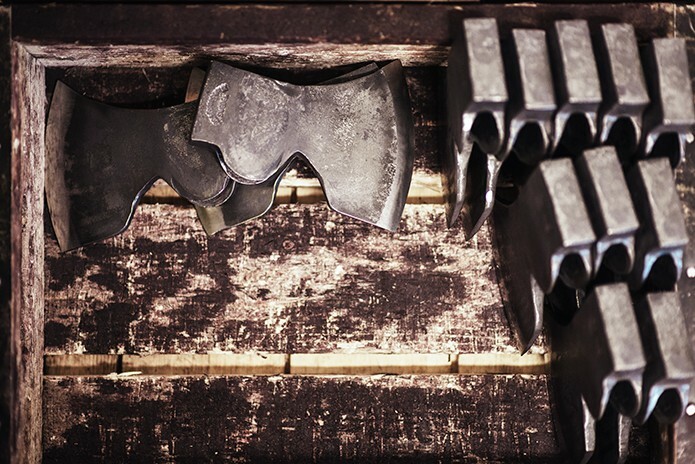 Axes, from the Stone Age to the present day, have been a vital tool for millennia, and whilst most of us do not need to use an axe every day in order to work, let alone survive, the axe is still an iconic and much used tool. The golden ages of agriculture and forestry, when axes were wielded by many a rural worker, are long gone, but the 21st Century has seen a rise in axe usage, not for work-a-day mass-produced axe users, but for an altogether different audience. 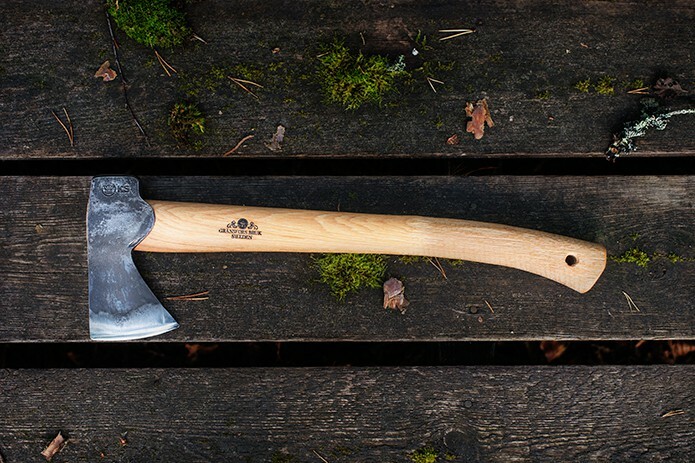 The rise in the popularity of bush-craft & survival skills, working the wood, reconnecting with nature and the like, has meant that authentic axes are back in demand, and Gränsfors Bruk axes especially so. 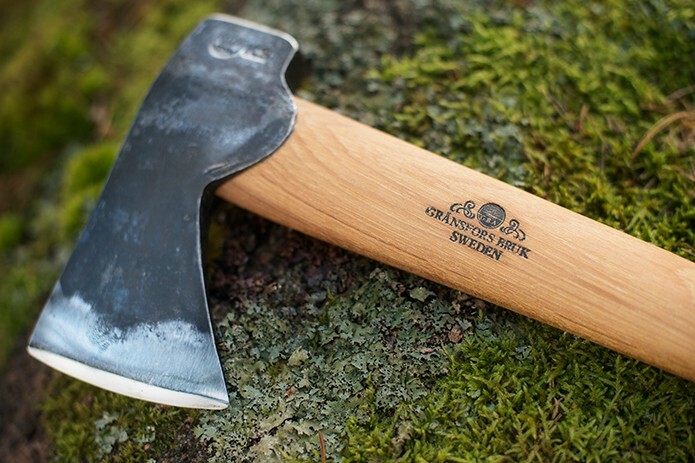 Ever since the mid-19th Century, Gränsfors Bruk have been producing high quality axes in northern Hälsingland, rural Sweden. 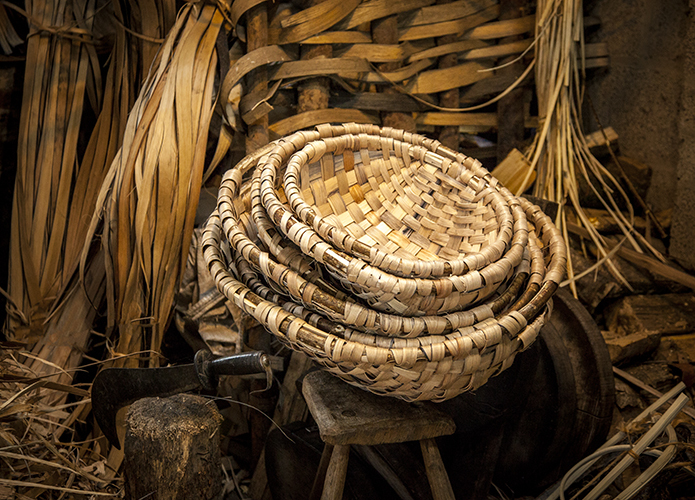 Traditional handcrafted tools were made to begin with, then there came an era of mass-production to service the huge demand of mass-usage by the forestry industry before the chainsaw, and then, when Gabriel Brandy acquired the company in the 1980s, a reversal in direction seeing a return to back-to-basics traditional craftsmanship. 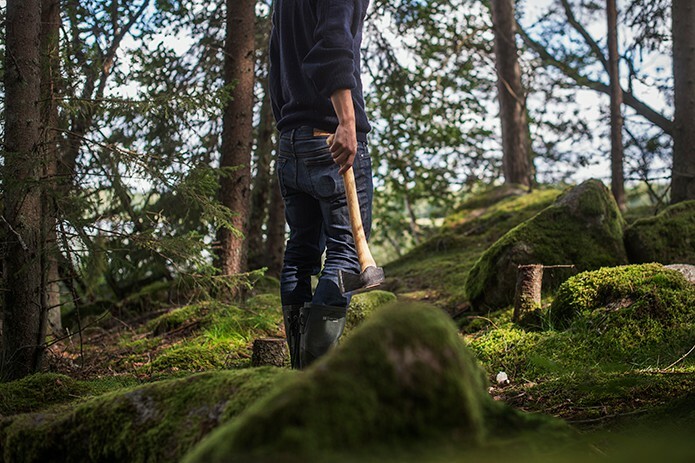 Ever since then an ethos has evolved that encompasses all things honest and wholesome, oft-cited Swedish virtues; a transparency when it comes to sustainably-sourced materials, sound working conditions, a commitment to minimalist design and reverence to the craft of axe-making, resulting in authentic axes which deliver practically, aesthetically, and environmentally. Firstly, for those readers who aren’t familiar with Gränsfors Bruk, please can you explain what you do? We make axes and carpentry tools here in Sweden, and have done for over a century, and sell to a very international customer base. 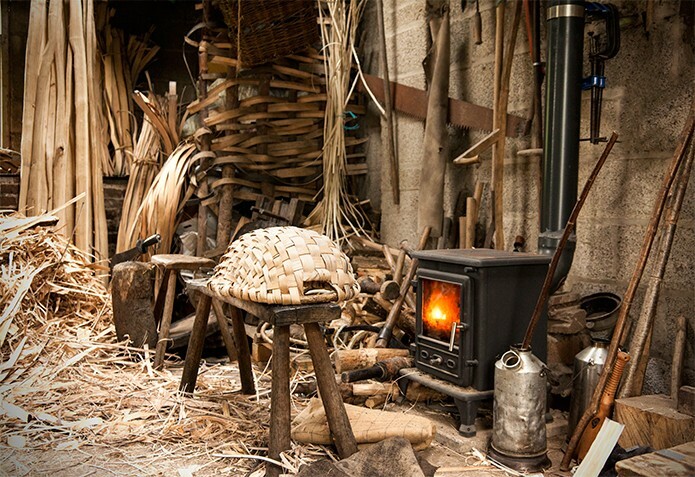 The courses we run in forging and log-building are part of our concept to put the products in a context. Gränsfors in northern Hälsingland looks as if it is the perfect environment for a forge specialising in axe-making – isolated and without any near-neighbours; is there anything in the local resources necessary to make axes, or are the reasons for the location of the company more complex than that? Although there are ancient iron workings in the area, such as Galtströms bruk (“bruks” means ‘works’, such as ironworks, glassworks etc), the area is not known as a location for producing iron, certainly when compared to other parts of the country. So it wasn’t so much the local resources to make the axes, but rather the local resources for which the axes were needed. This is an area where the forestry industry is strong, and there has been a tradition of paper mills along the coastline, and so axes were necessary historically to cut down the trees for this industry and others. Today, the area may seem isolated, but 100 years ago this was not the case and the countryside was a lot more crowded, with more people working in the forestry and agriculture industries, so the area would not be considered so remote. The stream that we’re adjacent to – Gränsfors Stream – has been harnessed to power machinery for making things for centuries (indeed, our own machinery was once powered by water), and there have been various industries, upstream and downstream of this spot, related to processing metal and forging steel for tooling of many kinds, including horse shoes, scythes, forestry tools and hooks, hinges for doors, tooling for harvesting machinery and ploughs, etc. In fact, there is an old nail forge only 150 metres upstream from here, which is now a community centre. 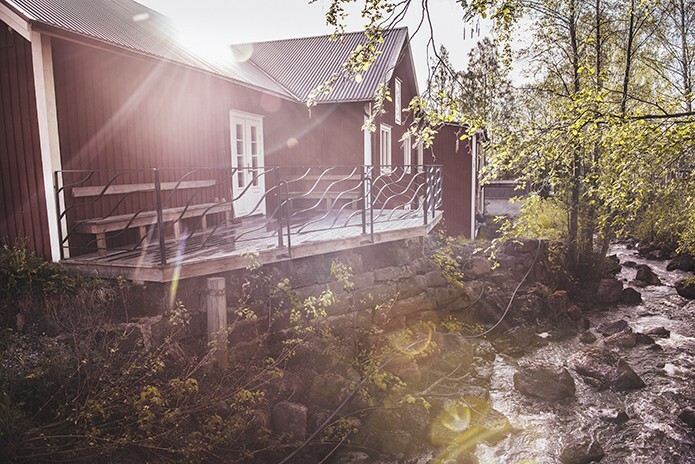 Gränsfors isn’t just renowned for its metalworking industry – there is also a pottery factory in the near vicinity which has been active since the 1860s, and is still producing pottery to this day. As part of your obvious and exemplary commitment to the environment I understand the steel used is recycled… Can you talk us through how using old steel works? 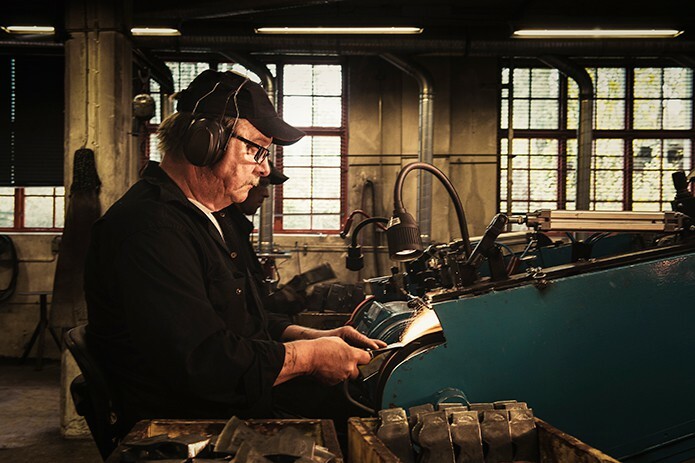 It’s really important for us to work with steel producers that have the same ethos over sustainability as us and for that reason we purchase our steel from a producer in Dalarna, only about three hours’ drive away, that specialises in recycled steel. Steel can be reused many times without deterioration, and so by re-using steel from old scrap cars and the like, it negates the need for new iron ore to be mined, which minimises the impact on the environment. 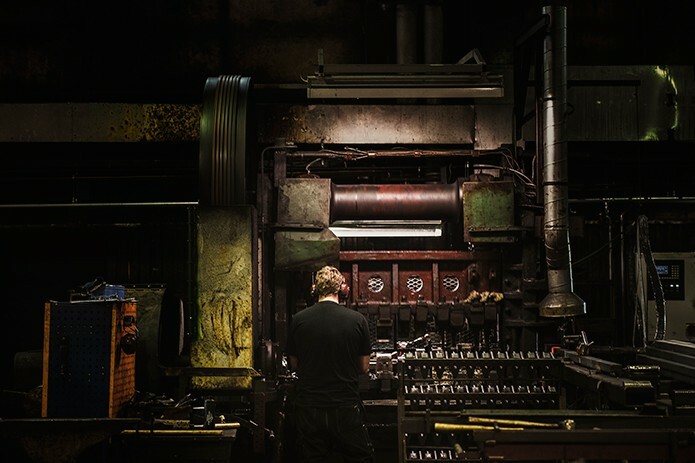 The steel goes through a series of rigorous checks, and is sorted into different grades, and through the steel producers’ skills in metallurgy, a blend of steel grades are accurately combined to create the perfect alloyed steel which comes to us in lengths of different thicknesses and widths, specific to the dimensions of the various axe heads that we forge. 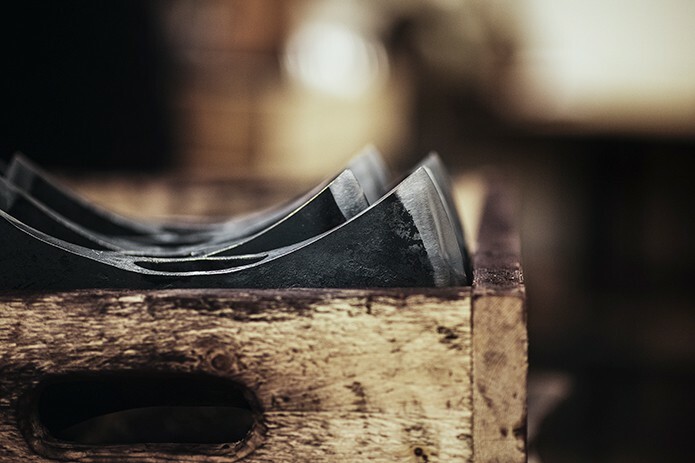 We have a very close working relationship with our supplier to produce a grade of steel with a suitable carbon content that is ideal for making axe heads, i.e. not too hard, but at the same time not too soft or pliable. We’re only a small company in comparison to others they work with but they like working with us as we share the same ethos. How important is the quality of wood in creating a bespoke axe handle, and do you have any favoured choice of wood? The quality of wood we use is of paramount importance, needing to be strong, durable and flexible. 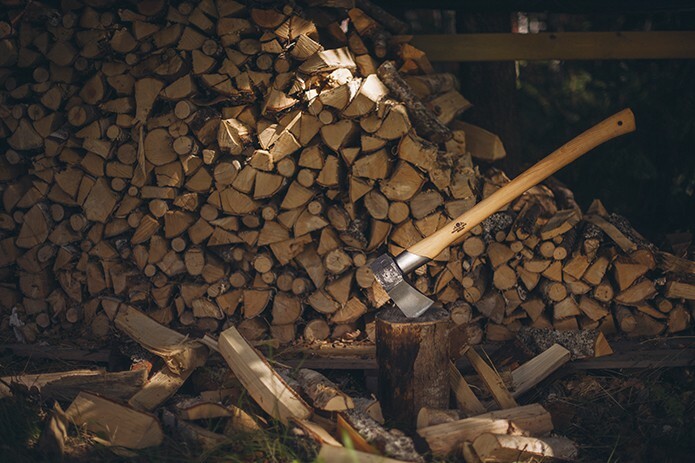 In previous centuries, birch would have been the preferred choice of wood, but we use American hickory for all of our axe handles today, with the exception of bok [beech] for carving hatchets. 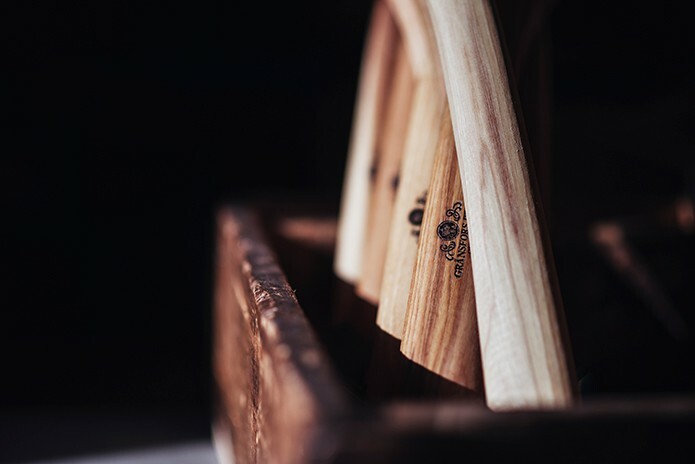 Hickory grows with long, parallel fibres, but it has to be grown in the right heat and humidity to make it ideally suited to axe handles, necessitating the need for it be grown quite quickly. We use American hickory, as European-grown hickory would be too slow growing. Hickory was once considered an exclusive wood, but it is now more affordable. The wood arrives into southern Sweden where it is dried, cut and turned into the desired shapes for the respective handles. The importance of drying is to ensure that when the axe head is fitted, it won’t come loose, which is what would happen if an undried handle was used. The handles are also soaked in hot linseed oil and treated with beeswax to further improve the quality of the wood and to make it resistant to water. 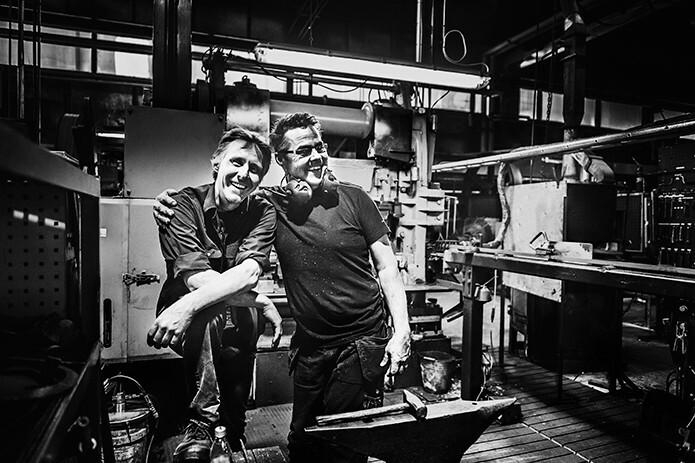 By way of an insight into your work, could you briefly describe the process of forging one of your axes – and how long it takes from start to finish? 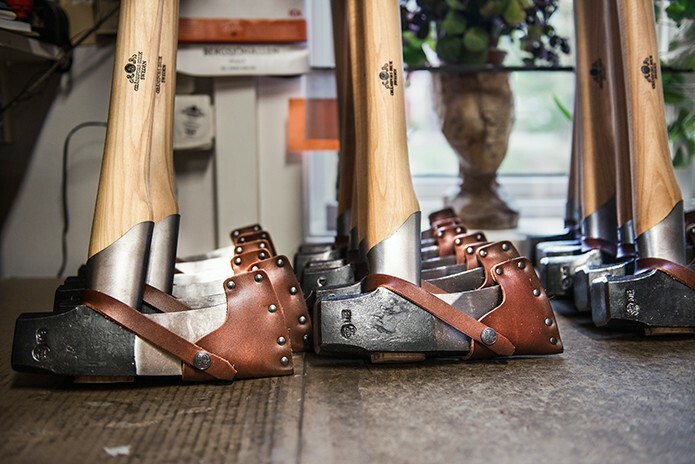 One of the key aspects of our axes is that they are all forged by hand, and there is no automated production line. 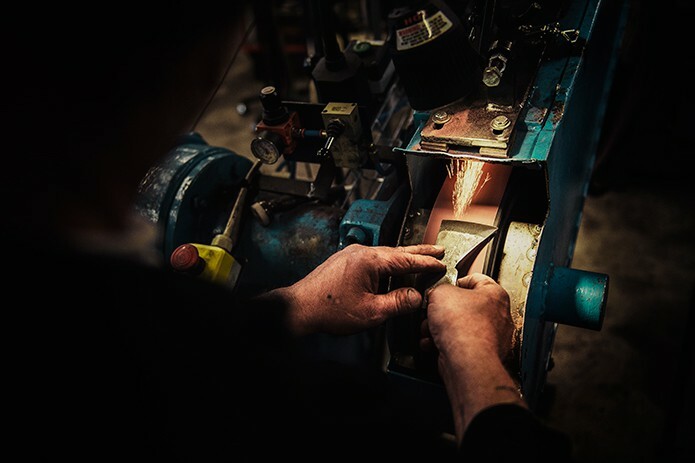 It’s also important to emphasise that it’s not all about the forge – the crafting of an axe head is also about the rough grind, hardening, annealing, fine grinding, polishing etc, which, again, is all in the hands of expert craftsmen. If you don’t grind well, it doesn’t matter how well you forge as the axe will be inferior, and vice versa. Likewise, if you make the bevel too thin when grinding, it won’t be tough enough to work. Also, when putting on handle, if the axe head isn’t attached securely to the handle, it will fail – all parts are essential. 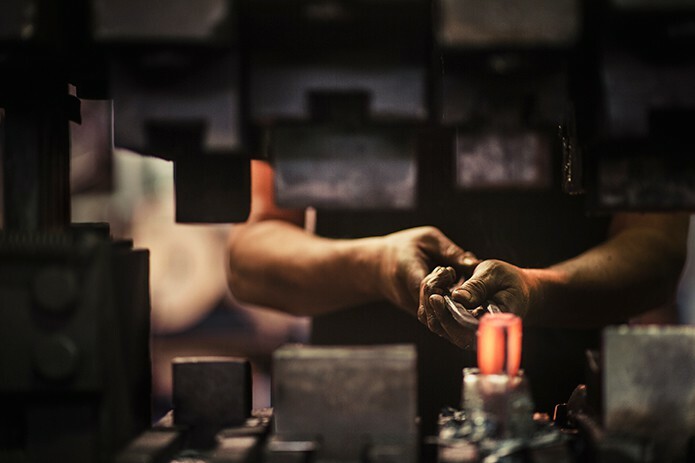 The first step in the process is selecting a steel bar – based on its width and depth – depending on the axe being forged. It is then brought into the forge and one end is heated in a stove to approximately 1200°C turning it a yellow-red colour which is then cut, depending on the length required, on an anvil. 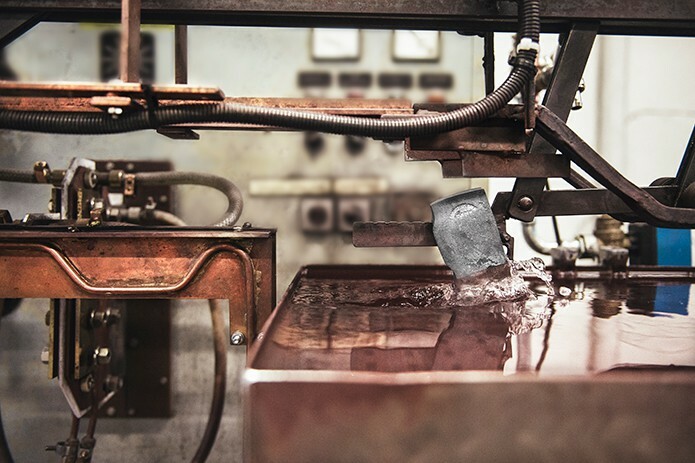 This rectangle piece of steel is then carried into one of our large presses, each of which has had its tooling set up individually for the type of axe being created, where it is forged to shape. 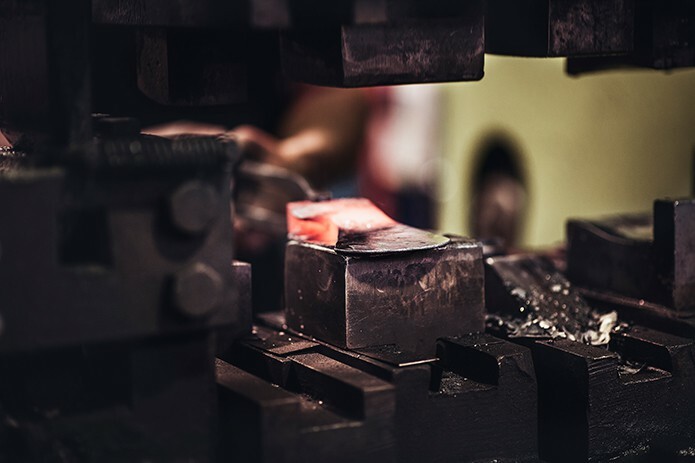 The axe-smith must operate quickly in the press to turn the hot steel into the required shape before it becomes too cool to work. This is an extremely skilful craft as the press operates at a speed of about eighty strikes per minute, and with a force of 180 tonnes per strike, there isn’t a lot of room for error. The final task for the axe-smith in the forge, before cooling, is to stamp their initials and the Gränsfors Bruk logo into the axe head, and then it is left to cool. 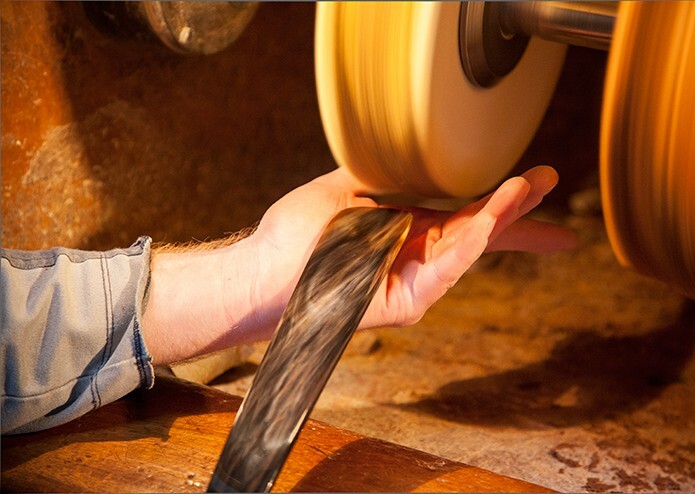 Once cooled, the axe head is passed across to another craftsman for hard – or coarse – grinding and sharpening of the axe edge. It’s only the cutting edge that it subjected to grinding, and the remainder of the axe head is left untouched. 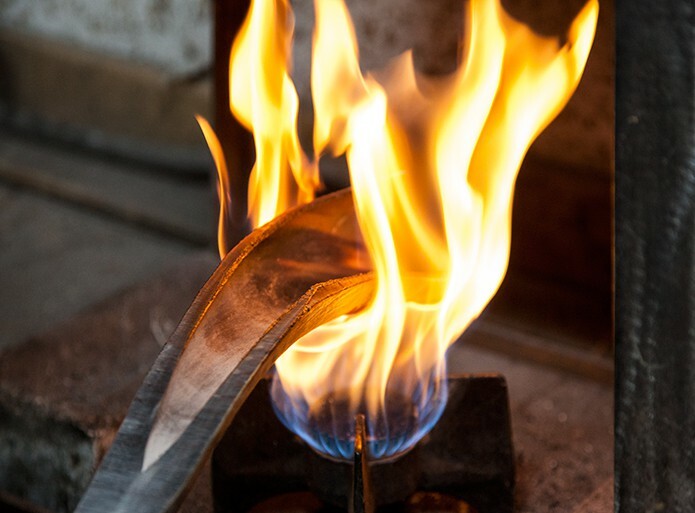 The next stage is to harden the edge through a process of tempering, which is carried out by heating the axe head to a temperature above 800°C and then cooling it quickly by placing it in cold water. Whilst this hardens the steel, it also makes it rather brittle, so the axe head has to undergo further treatment through a process of annealing, whereby the axe head is heated to a temperature of approximately 200°C in an oven, where it remains for an hour, and during this time, all the stresses in the steel caused by forging and hardening are removed. Whilst we only subject the cutting edge of the axe head to grinding, giving our axes our distinctive ‘unpolished’ look, we still do have to remove some of the forging burrs on the surface that appear from time-to-time, which also helps provide greater resistance to rust. We do this through a process of tumbling, whereby the axe head is placed amongst a number of small ceramic balls which are tumbled together, smoothing the axe head. 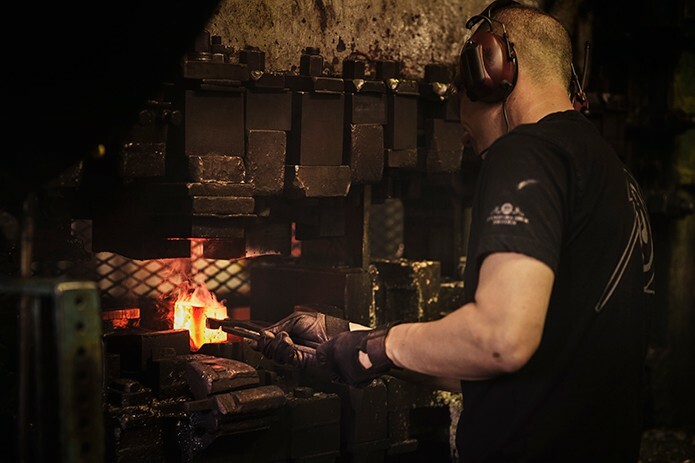 To ensure exacting standards, we then test each axe head for the hardness of its steel, ensuring it is just right for our purposes – neither too hard or too soft – and we do this by striking on each corner of the axe head with a hammer to check that no resultant cracking occurs. Once we’re satisfied with the quality of the axe head, we then sharpen and polish it to make it sharp. Some axe heads require differing angles of grinding in order to make them better suited to their use, for instance carving or splitting wood. The final stages in creating an axe involve dipping the axe head in oil – to protect it from rust – and then once dried, the hickory handle is fitted. Once done by hand, we now fit the handle with the help of a pneumatic press which squeezes the handle into the axe head. This is kept in place securely by the steel axe lip of the axe head as well as a wooden wedge made from beech which is driven into the end of the axe handle through the axe eye. The wedge is sometimes secured even more firmly by steel inserts. 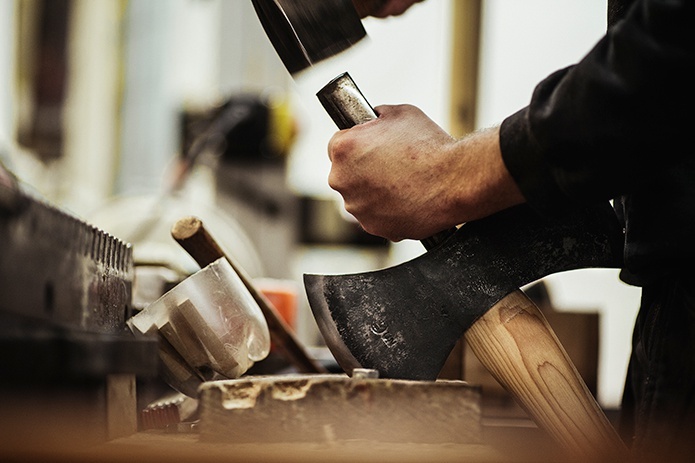 The axe is then subjected to quality control testing to ensure there are no defects; provided it passes these tests, the axe is given a leather sheath to protect the cutting edge. 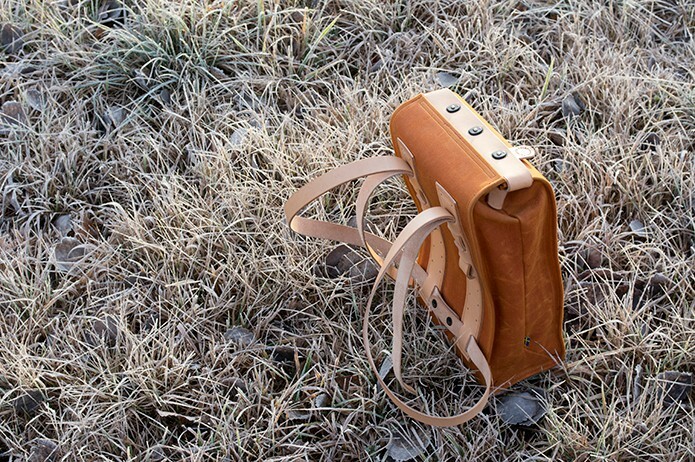 Each sheath is made from organic, vegetable-tanned leather made in the middle part of Sweden. As there are a number of complex steps in the process in making one of our axes, in 2013, we looked at our traditional processes in a modern way to get control of our production work-flow to encourage continuous improvements with respect to material handling, ergonomics and team-work. 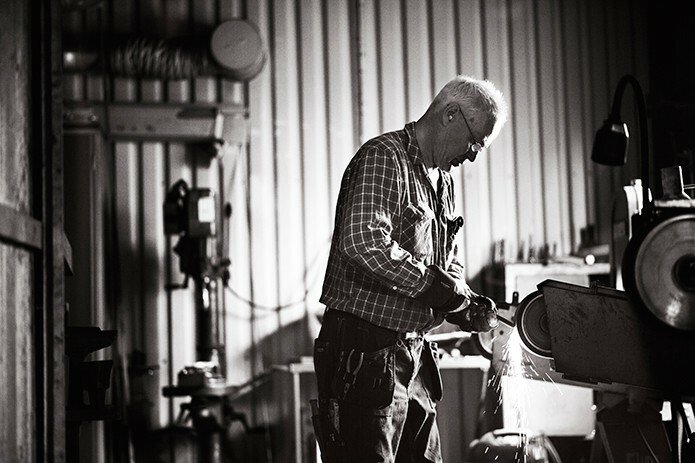 With the movement away from mass-production back to a craft ethos, have the materials and processes used changed much since Gränsfors Bruk axes were crafted a hundred years ago when the company was first set up, and to what extent would a 19th Century blacksmith recognise the raw materials and techniques you use today? The principles of tooling are still the same and the way the axes are forged is pretty much untouched – we still use old machinery (one press is 100 years old and the youngest about 70 years), and the axes are stamped with the blacksmith’s initials, which hark back to the early days when the village blacksmiths stamped their axes with a personal logo – but working conditions differ greatly and we use more modern techniques to help in specific tasks. In the forge itself, the main change would be the heating of the steel. Whereas the steel would have originally been heated on burning coal, and more recently oil heating, this is now carried out by electric induction heating the majority of the time, although oil heating is still used occasionally when absolutely necessary. After forging, the axe heads would have subjected to coarse grinding to sharpen the edge by a team of grinders using grinding stones, which was a time-consuming process, but this is now carried out using ceramic grinding belts, which is far quicker and convenient to the personnel carrying out the task. To harden the edge, in the past this would have been carried out by placing the steel in lead heated to 820°C, whereas this is now carried out by electric induction heating. To improve working conditions, no longer are workers subjected to noxious paints, lacquers and solvents as the would have been the case in the past, as we don’t use them. Likewise, there are now state-of-the-art ventilation and filtration systems to remove excess elements at source, so they’re not circulating in the air. Before proper ventilation systems, workers could have been operating in freezing conditions in winter and 50°C in the summer with all the furnaces on, which would not have been pleasant. Another change is that in the past, the blacksmiths and grinders would have been working on a piecework arrangement, which is no longer the case. Can you describe in a little more detail the ‘craft enterprise’ aspect of Gränsfors Bruk, such as courses in forging and log-building? 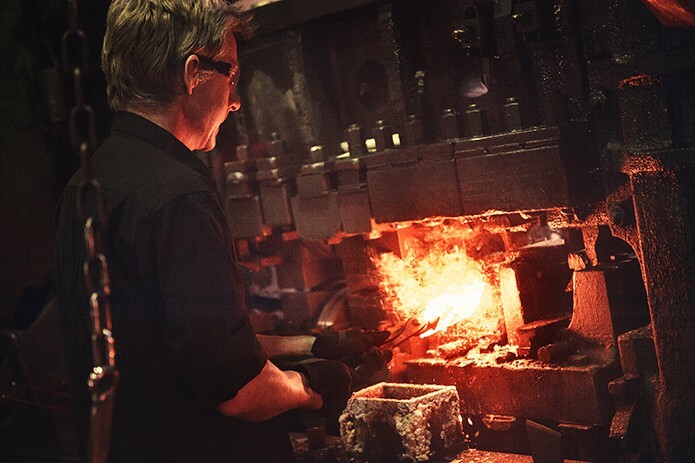 We have been running courses since the 1980s, both in forging and log-building, and for those enrolling on courses in the training forge, it used to be a way of finding blacksmiths to work here once upon a time. In the ’80s and ‘90s we used to run six-month courses, and one might stay at the end to become an apprentice. 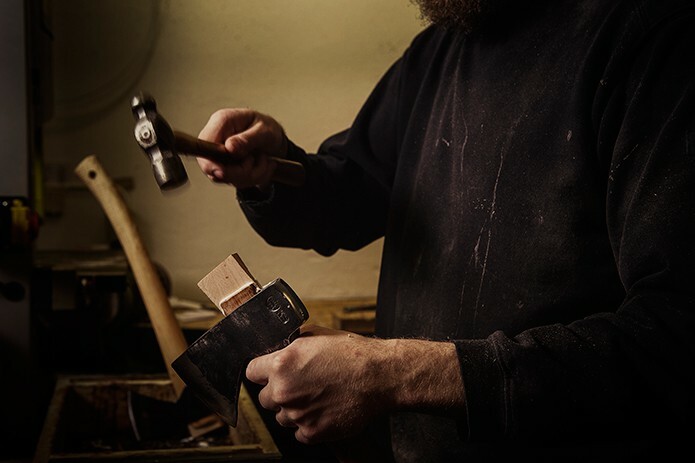 We also used to run week-long courses, but found that for most people this was just too much of a commitment, so in addition we introduced a range of two-day courses either to give people a taster in how to forge and grind an axe, as well as fitting a handle, or specialist courses, such as making Damascus. The log-building courses are designed to show participants the various stages in building a log house, using both traditional and modern equipment. Instruction is usually in Swedish, but it is possible to attend courses in English. 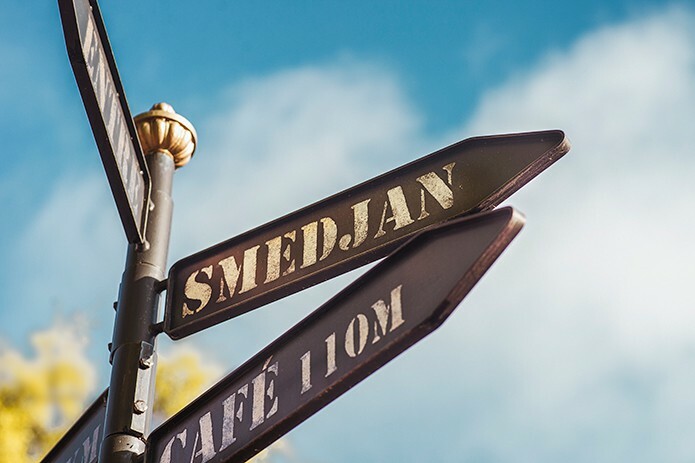 If participants don’t want to travel too far, they have the option of staying in one of our adjoining log cabins or pitching a tent or caravan and we have a restaurant very close by. 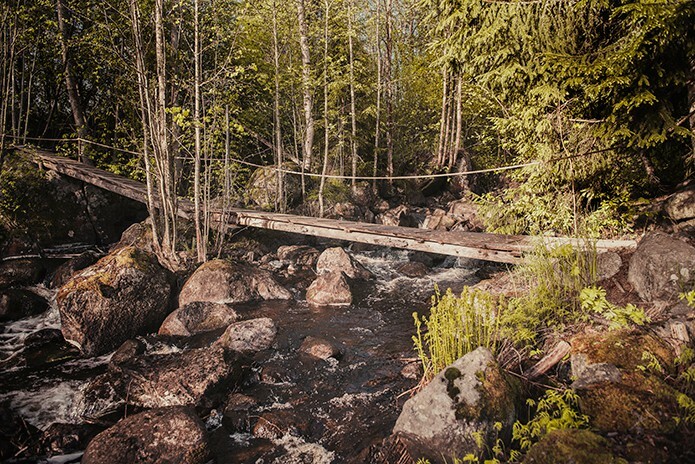 Your fellow Scandinavian Lars Mytting’s wood-inspired books have become bestsellers in many different countries and Ray Mears’ television programmes about bushcraft have a strong following in the UK and elsewhere. Have you seen any knock-on effects from this change in emphasis back to traditional past-times and skills – such as bushcraft – whether in people attending your courses or buying your tools? To a certain extent, yes. In places like America and the UK, we’ve noticed an increase in demand corresponding to the bushcraft phenomena. 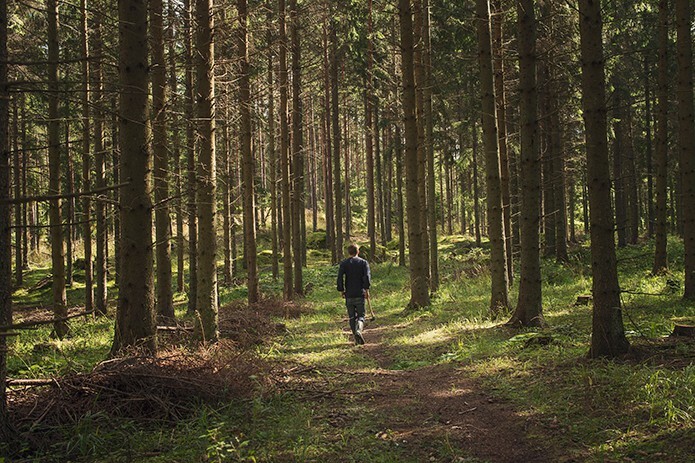 Bushcraft as a concept is actually pretty new in Sweden. However, since we are used to “Allemansrätten” [a ‘right to roam’] and a widely-spread tradition of hunting and fishing, many people spend their free-time in the outdoors, and have done so since way back. Having said that, times are changing, and as more-and-more people are moving to the cities, like Stockholm and Gothenburg, I can see there will soon be a time when these activities will need to be more organised, so bushcraft activities will develop. With the increase in demand for your products, how does your location affect your ability to find craftsmen? The village of Gränsfors is located in a sparsely populated part of Sweden, and I’d go as far to say it’s almost impossible to find someone who has got the experience that we need in the local area. As a result, we have no choice but to train them here. It’s very much about focusing on the person and their attitude and ability to learn, rather than what direct skills they have upon joining. Going forward, how do you foresee the future for Gränsfors Bruk? We will still continue in the same vein as we are currently. We will continue to bring out new products and grow, but at a pace we can cope with. It takes time to train people in their respective roles, and we’ve grown from 25 to 40 staff in the past few years alone, so there’s many things that need to be developed as we scale the business. Having a high quality work environment and setting standards for a product that are extremely high are two of our most important core values, and these two things will always lead us. 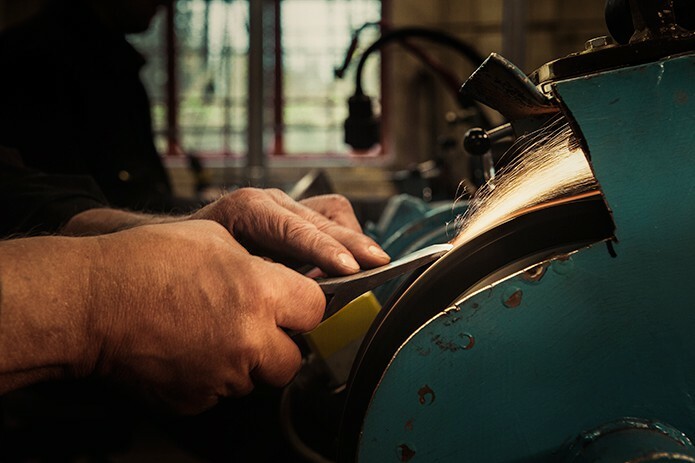 We have demand for our axes from customers in over twenty different countries, and as we’re still quite a small company, we have to be confident that we can satisfy the demand from customers all around the world, but not compromising our core values. Thanks to Thomas Ericsson for taking time out of his busy schedule to answer our questions. All images courtesy of Gränsfors Bruk.